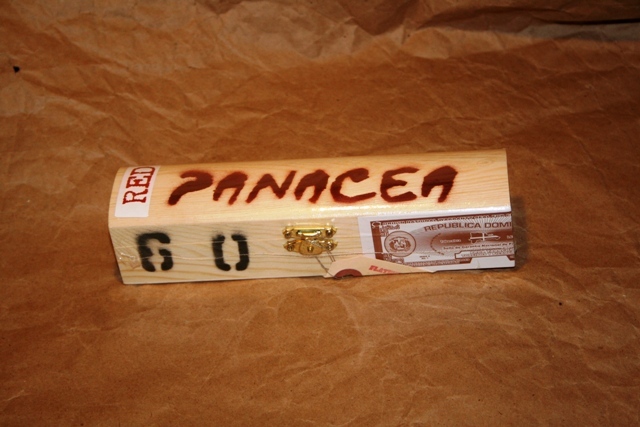 Grande Red 760 "Peace Maker"
PANACEA Red 760. We like to call this package "The Peacemaker". The 760 is the same blend as our classic Red label Habano, but BIGGER. Our biggest size to date...a 7 inch cigar, with a 60 ring. The Patriarch of the Grande line. A Brazilian maduro wrapper and Habano binder surround a blend of: Seco Cubano, Ligero Piloto Cubano, Ligero Olor Dominicano, and Ligero Nicaragua. 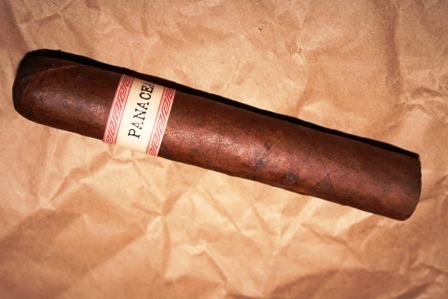 Like our PANACEA Black Maduro -this cigar is smooth and balanced. The difference is in the taste and strength. PANACEA Red has all the nutty, spicy, and sweet flavors of the black, but in a bolder body and pallet. If you like a strong cigar but insist it be balanced, this cigar will become your favorite. Also, you'll need to budget some extra time for the 760. Why is it called the Peace Maker? Send one to a friend (or more appropriately; adversary) and see what happens. This is a cigar that will be written about (I hope) for years to come. We sure had a blast putting the whole thing together. Outstanding cigar. Amazing flavor and just immensely enjoyable. Based on my experiences, it is a mild cigar and that is perfect for me. It is a great way to chill out with a good beer or an old tawny port in the evening. Customer service and shipping is outstanding. I am, and will be, a frequent customer. Thanks!! I'm new to Panacea and generally love Ligero filled smokes. Today I tried the 760 Peacemaker and was blown away by now absolutely delicious this cigar is. No question this Habano sports fine Ligero tobaccos, as I could taste them in every draw. Yet, never did I get a blast of pepper that overwhelmed the balanced flavors underneath. From first light to finger-tipped nub the cigar held true to Paul's claim that the balance sets the 760 apart from the field. I could even retrohale the smoke and never got that nose burn that ligeros generally have delivered, and the taste was only heightened when doing so. I will smoke more of these and recommend them to my buds. My smoking pals commented that I was neglecting my fine Sierra Nevada Pale Ale and funny thing is I wasn't missing it. WoW! This cigar is best described as a smooth beast. I smoked it the day it arrived, and the construction, burn, draw, and taste were second to none! The little wooden box is a nice touch as well! Another true winner from Flatbed! Huge, and flavorful. Much smoother than the smaller reds- this cigar is special. This is the cigar to smoke when your... less enthusiastic significant other is away for a few days- Three hours of nirvana. Seriously- the only flaw with this cigar is that it lasts forever- if I could get it in a shorter cigar, I would, but they just don't smoke the same! Buy it, buy a box, buy a 160 pack for your wedding- you won't be sorry! I wrote up my review on my site (CigarNewbie) but wanted to say this was a wonderful cigar. I was surprised how quickly the time went (nearly 3 hours!!). Very flavorful without being overpowering. I think I've found a new favorite cigar. Definitely will be ordering more of these in the near future.